Wild Chaga Mushroom (Inonotus obliquus), hand harvested from Canada’s North, is available for sale in small chunks or ground. Available in 100 g or 200 g pouches. Ethically harvested by Laughing Lichen in Canada’s remote northern wilderness! Category: Bulk Herbs & Mushrooms, Chaga Products, Wild Herbal Tea. 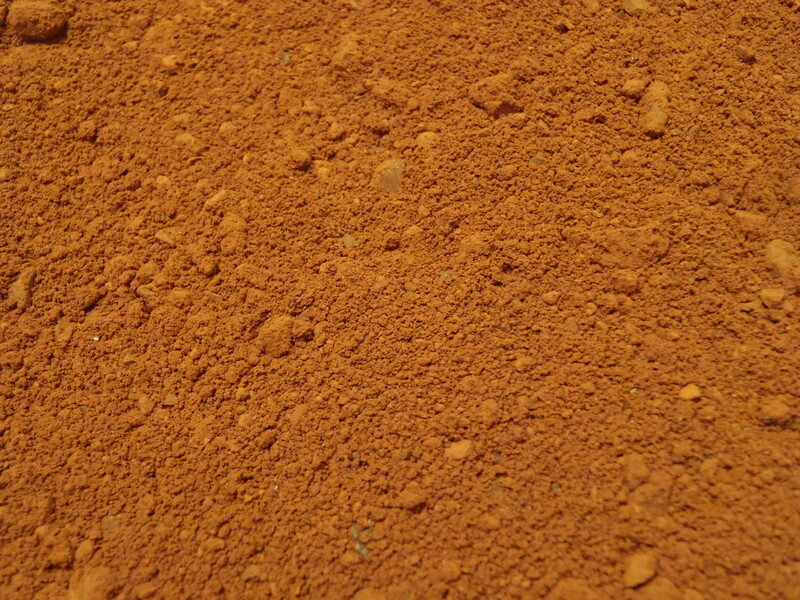 Tags: Buy Chaga, Buy wild chaga, canadian chaga buy, Chaga, chaga canada, Chaga for sale, Chaga Mushroom, chaga mushroom for sale, chaga mushroom tea, chaga tea, chaga tea for sale, Inonotus obliquus, Inonotus obliquus buy, Inonotus obliquus for sale, kabanoanatake, Wild Chaga. Chaga Mushroom (Inonotus obliquus), which we hand harvest from Canada’s north, is available for sale in ground, small chunks, as a Chaga Chai mix, or Chaga Chocolate Mix. 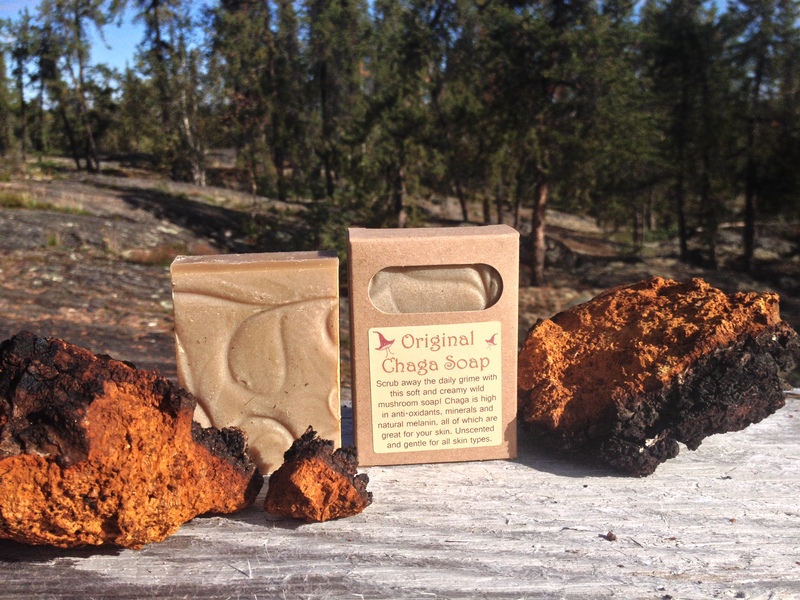 We even make Chaga Soap! This amazing wild fungi is said to contain significant amounts of antioxidant compounds. The appealing light vanilla flavour and nutty aroma of wild Chaga tea will help you clear your head and harness that extra energy you need to finish a hectic day (without the caffeine!). This wild fungi can also be blended with other teas, beverages or enjoyed chilled on a hot day. The renowned Wild Chaga Fungi is becoming popular in North America as a super-food. 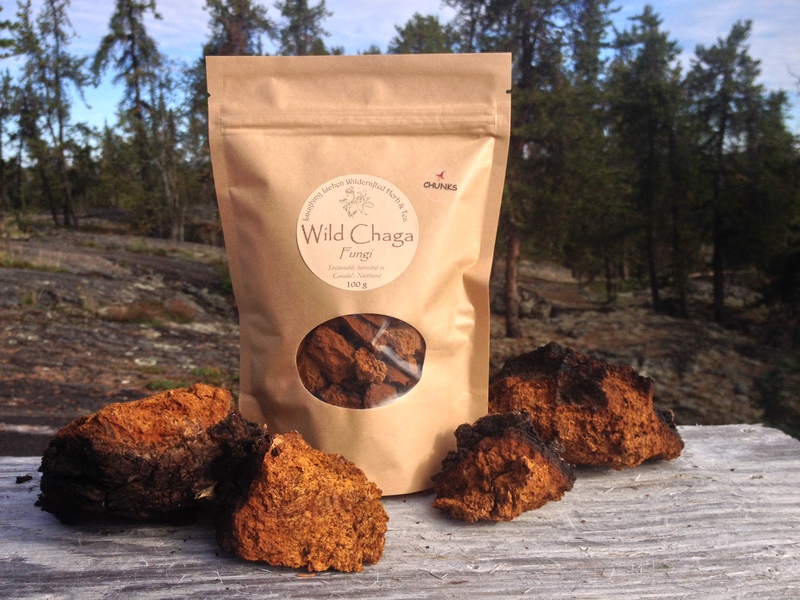 All of the Wild Chaga we sell is hand harvested by us in an ethical manner from birch trees in Northwestern Canada. Unlike many suppliers of wild mushrooms and fungi, we do not purchase from other harvesters. We only sell what we harvest. 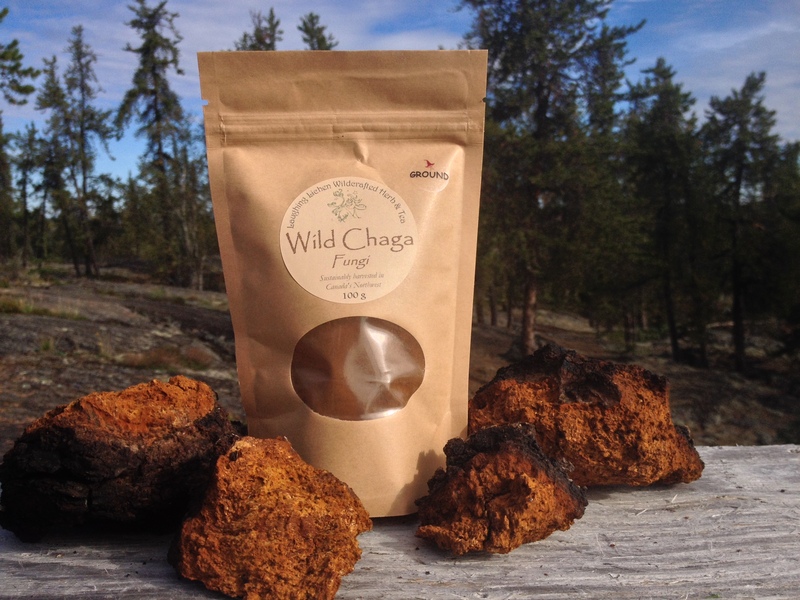 This way we can guarantee the quality and ethical harvest of the wild Chaga we sell. Chaga chunks that can be re-used for multiple pots of tea or in ground powder form for those who prefer loose tea bags and a stronger flavour. For an added “kick” check out our Wild Chaga Chai, or a gourmet Chaga Chocolate Mix. Only Chaga harvested from birch are utilized for tea and medicine. You might find look alikes on species of Aspen, willow, or popular. Please avoid these specimens. Betulin, a compound found in birch bark, has medicinal properties that are said to benefit human health and immune systems. Betulin is difficult for our bodies to break down and utilize when harvested directly from the bark of the birch tree. When wild Chaga develop on birch trees they change the betulin’s chemistry, transforming the compound into a form digestible to humans. The betulin is absorbed by the Chaga mushroom as it grows. The healing powers of Wild Chaga have been well documented over the past fifty years. Only a small amount of Chaga is required to make tea (1/8th of a cup will make 2 liters of brew!). If you plan on adding the Chaga to your smoothies or hot chocolates, coffees etc, you can use more. We also use this fantastic fungi in our favourite baking recipes, especially brownies. Our four legged friends (dogs) enjoy the benefits too! Wild Chaga Fungi (Inonotus obliquus) is found in the world’s northern regions. Northern Chaga tends to be smaller in size, denser and takes longer to grow than wild Chaga growing in southern Canada and the United States. This elusive fungi has a unique symbiotic relationship with its host the birch tree. Some also call it a parasitic relationship. 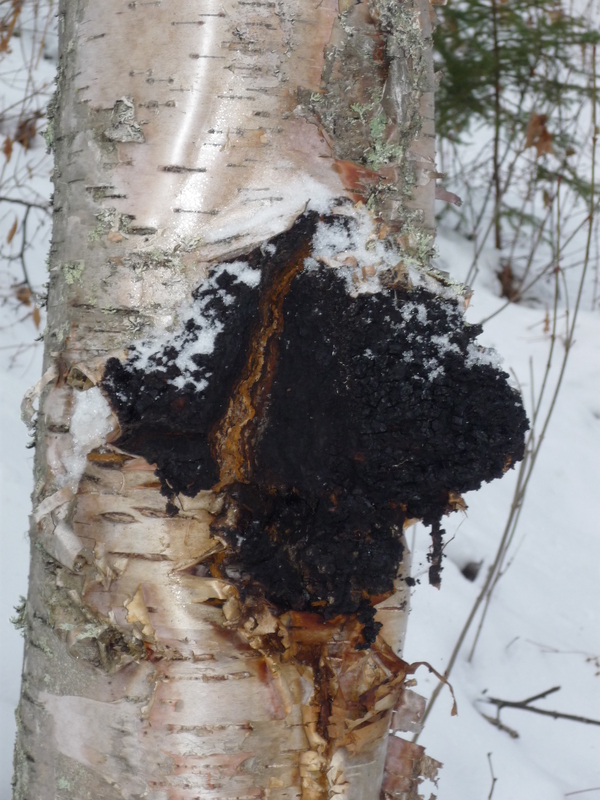 One thing we have learned from years of harvesting and studying the biology of wild Chaga across Northern Canada is that without birch there would be no Chaga! It is hard to tell if Chaga actually causes its host tree’s eventual death or not as there are many factors involved. When the host birch tree dies so does the Chaga growing with it. Once this happens a rare, special event occurs in which the fruiting body erupts for a short time on the trunk of the birch tree. This fruiting body looks nothing like the sterile conk of Chaga that we collect for tea. Instead it forms a thick 1-2 inch layer comprised of thousands of tiny spores that blow away in the wind or are carried by insects to new birch trees. Thus the life cycle of Chaga begins once again. To ensure that the entire life cycle of wild Chaga is completed we do not harm the host birch trees with logging spikes or cut living trees down to access out of reach chaga. This practice is becoming increasingly common in northwestern Canada and in no way does Laughing Lichen support this type of wildcrafting. If you are collecting Chaga for your own use please do not dig deep into the myceluim layer (A fuzzy mass of branching thread-like fungal threads) found between the Chaga conk and the truck of the tree. If you damage this layer the conk will stop growing. If you leave it intact you can return to the same tree within 3-5 years to re-harvest more Chaga. It is very important to only use Chaga for personal use that is collected from unpolluted environments and living birch trees. 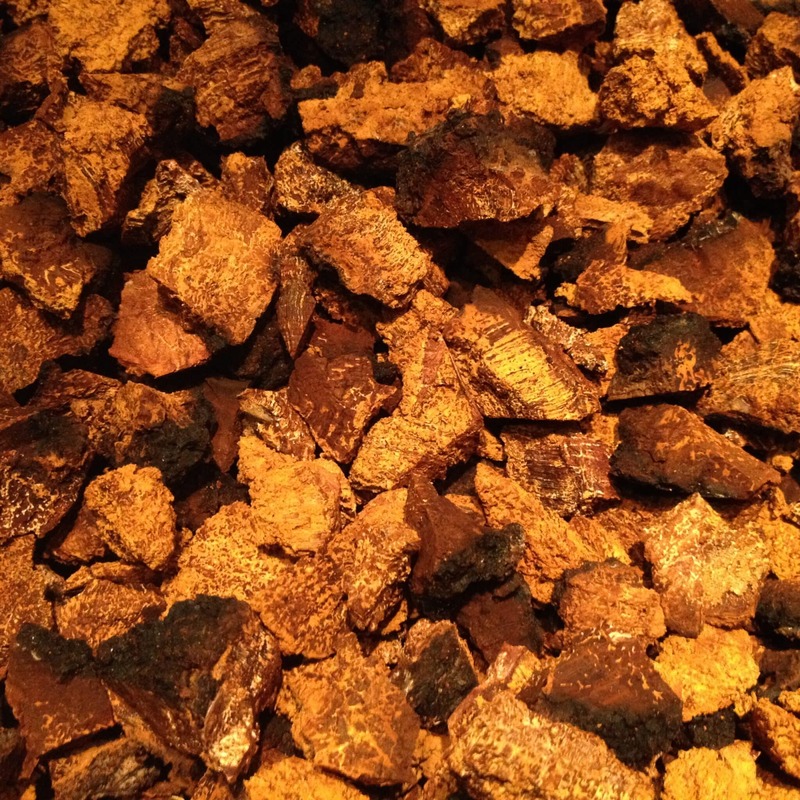 How is your chaga dried? Our Chaga is air dried and occasionally dried in an Excalibur Food dehydrator. I would like more specific information about your processing methods please (hot water/extraction/fermentation), and the quantity of each of the medicinal ingredients. 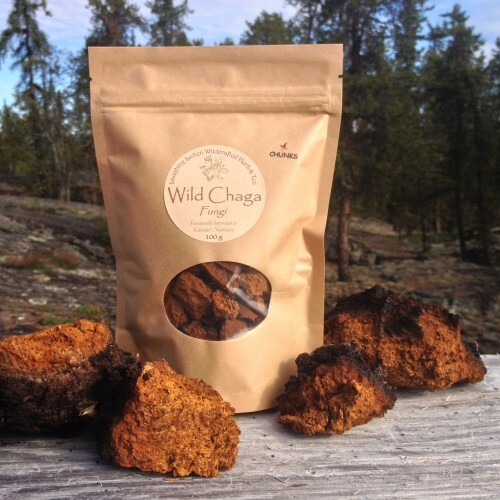 The chaga we sell is 100% wildcrafted chaga. The medicinal properties of this amazing fungi can be extracted via hot water extraction, with alcohol or glycerin(for tinctures). I make a large batch of tea each week for daily enjoyment. For an alcohol extraction I recommend 100 proof or preferably higher alcohol content vodka for your tincture. For chaga in baking I simply simmer a very fine grind(coffee grinder works great) of chaga in hot water(15 min) then add butter or coconut oil and heat on low for 20 min. The mixture is then added to my recipes such as brownies of cookies etc. If you have further questions please feel free to email or give me a call. A publication which has some great recipes with exact amounts specifically for chaga recipes is called “Chaga, King of the Medicinal Mushrooms, By David Wolfe. The chaga chunks make a lovely rich tea! I was surprised at the full bodied flavor in a herbal style tea. On cold days I suggest also throwing in a dash of grated ginger as it boils to give it a fiery touch! Amazing product.After drinking chaga – I have clarity of the mind,energy,strong and flexible muscles and calmness. I use 4 chunks of chaga in pot and add 1 litre of water. Set heating on 5 and after the water boils reduce to minimum setting and cover with the lid. Set for 50min. After the process is done it will leave 0.5 litre of chaga tea.Let it cool of a bit. After that I add lemon juice.In other times I mix chaga with oolong tea – they blend nicely. This chaga is incredible! I love how great I feel after making myself some tea Thank you and keep up the great work Laughing Lichen!